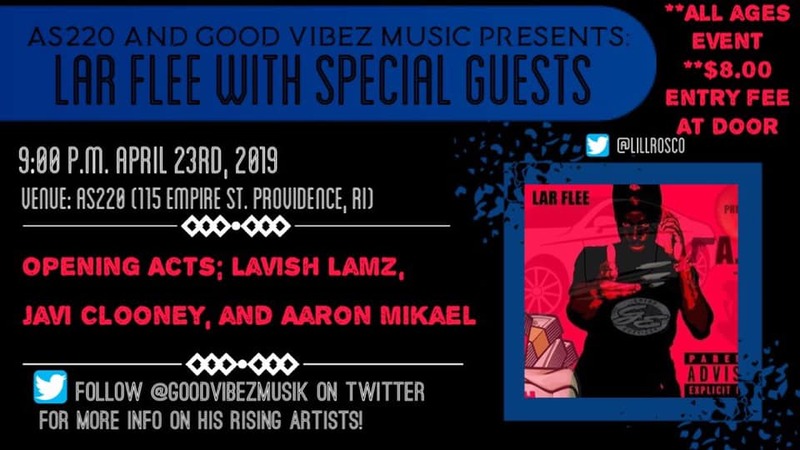 AS220 and Good Vibez Music Present Lar Flee, a Boston hip hop artist with a growing fanbase. Lar Flee brings the sound of the streets along with a touch of lyricism, blending them perfectly. Make sure to come out and show your support for a up and coming New England Hip Hop Artist, along with performances from Houston artist Javi Clooney, Rhode Island artist Lavish Lamz, and Rockland, MA artist Aaron Mikael, this will be a night to remember. Don’t miss out on this show! $8 to get in to the show, all ages. Tell a friend!